On February 21, 2018 Temeka Davis, RHIT, and I hosted a webinar on how to correctly code pressure ulcers. This blog lists three important tips from our presentation for proper coding of pressure ulcers. The National Pressure Ulcer Advisory Panel (NPUAP) serves as the authoritative voice to improve patient outcomes in pressure injury prevention and treatment. It is an important resource for coding professionals. Internationally recognized, the NPUAP provides established pressure ulcer documentation guidelines to describe the different pressure ulcer stages. This verbiage is accepted and can be translated into a stage associated with ICD-10-CM codes for proper pressure ulcer coding. I encourage you to visit their website, http://www.npuap.org/, for in-depth information on the latest in treatment and terminology on pressure ulcers, as well as full definitions of stages for coding pressure ulcers in ICD-10. Pressure ulcer/injury codes are all located in category L89 of the ICD-10-CM code book. There are more than 160 codes in this category of ICD-10-CM and savvy coders should take time to fully explore and understand this chapter. Category L89 contains combination codes to identify the site, laterality and pressure ulcer stages. ICD-10-CM also includes a code category for pressure ulcers that span multiple body parts. Individual codes are generally 6-characters long with 5-character codes for pressure ulcers of unspecified sites. The category of codes for pressure ulcers (L89) has a note to code first any associated gangrene from category I96. 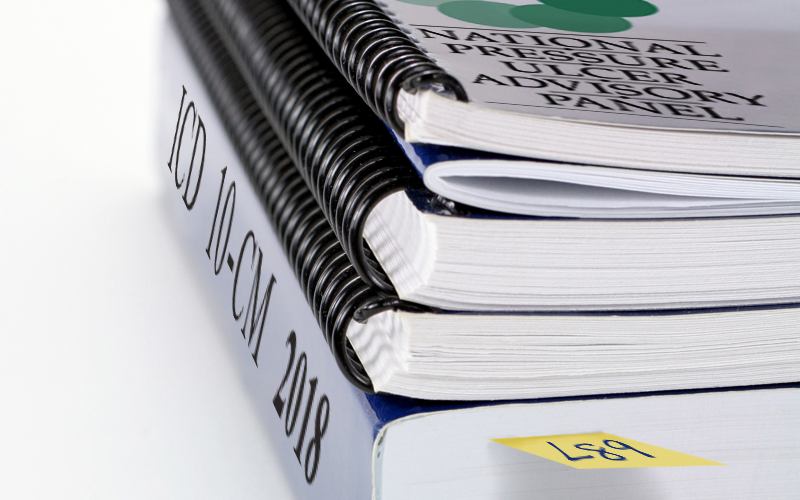 Because there are several pages of ICD-10-CM codes for pressure ulcers, make a note at the top of each page of your ICD-10-CM manual to remind you to code associated gangrene first, if applicable. ICD-10-CM Coding Guideline I.B.14 states: “code assignment may be based on medical record documentation from clinicians who are not the patient’s provider.” Documentation can be from a physician or other non-physician practitioner, such as a wound care nurse. However, you must have a diagnosis from the physician that indicates a pressure ulcer. Nursing or wound care documentation can then be used for more complete coding pressure ulcers. Interested in learning more about coding pressure ulcers and other procedures? Sign up for our monthly blogs.